Kurrachee Camp from the Church tower looking NW. bl.uk > Online Gallery Home	> Online exhibitions	> Asia, Pacific and Africa Collections	> Kurrachee Camp from the Church tower looking NW. 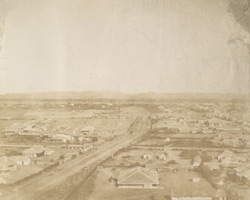 General view of the cantonments in Karachi taken by Capt Houghton in 1858. Karachi, one of the world's largest metropolises, was once the capital of Pakistan. It is now the capital of the Sindh province in the lower Indus valley, and is the financial and commercial centre of Pakistan. This huge city was however developed only in the mid-19th century. Its history prior to this is sketchy but it is believed to be the ancient port of Krokala on the Arabian Sea, visited by Alexander's admirals in 326 BC. Karachi is built around a bay which is a natural harbour and protected from storms by a group of small islands. The small fishing village became a trading port under the Kalhoras and the Talpur rulers of Sindh but the port (Kharak Bunder) remained small. It was completely transformed when its harbour was developed by the British after they conquered Sindh in 1843. The city rapidly grew and the British undertook several improvements starting in 1854 so that the present port took shape. This is probably a view in the cantonments which were built to accommodate British forces in the mid 19th century. They were semi-permanent in nature and laid out separately to the 'Old Town' in a linear fashion within a rectangular grid, as was usual for European cantonments on the sub-continent. This area later became the basis of the 'New Town'.